As Grog Boat celebrates its first birthday, we are excited to announce that our site will be expanding outside of the realms of gaming and movies. We are prepared to set sail into the vast, wild seas of music, literature, visual arts and more. 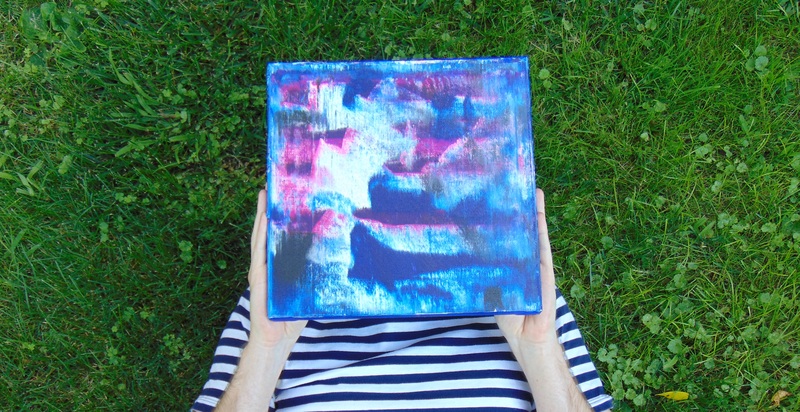 In kicking off this voyage, I am proud to feature Fraser Radford, an emerging visual artist operating just outside of Brockville, Ontario. I first met Fraser at the Marriane van Silfhout Gallery this past July. It was the opening reception of the “Bliss” exhibit, and Fraser’s ink painting “Drift” was among the featured works. I managed to make my introductions and arrangements for a subsequent interview after he had finished with a group of guests and just before another interviewer pulled him aside for some questions and a picture. In the fall of 2014, a sculpture was installed at the Japanese Embassy in Ottawa, Ontario. 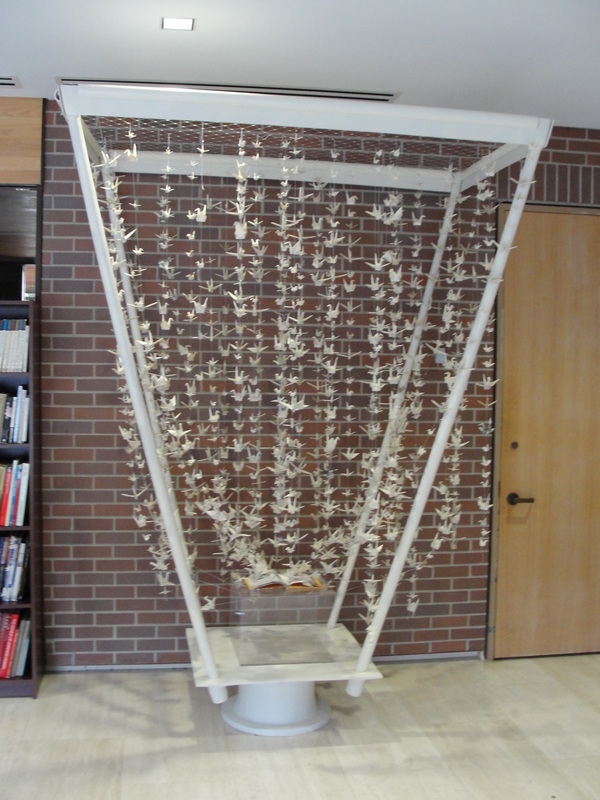 This sculpture contained a thousand paper cranes suspended over an open book. The piece is a tribute to Sadako Sasaki, a victim of the Hirosima bombing of August 1945 and the subject of the novel “Sadako and the Thousand Paper Cranes” by Elanor Coerr. In Japanese legend, if one folds a thousand paper cranes, a wish of theirs would be granted. This encouragement set Fraser on a creative path that would eventually lead to him meeting the Japanese ambassador, with whom he had discussed his piece. Fraser had recalled how nervous he was about the meeting, and how much attention he had put into the courtesy he would extend. In both size and subject, Senbazuru was an ambitious project. He was to fold a thousand paper cranes (made from the torn pages of books on Hiroshima and Nagasaki) and suspend them over an open book, creating the appearance of the cranes flying from the pages. The wish is for an end to nuclear weapons, and speaks to one of the most significant wartime events of the twentieth century. Having learned of Sadako’s story years before, he found this piece to be a personal expression, as opposed to a moral instruction to be foisted upon the audience. 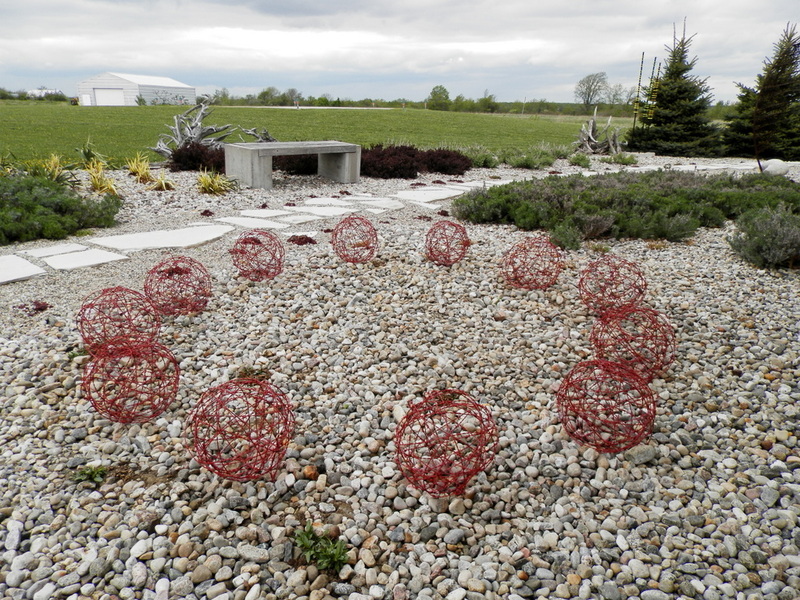 Ceremony draws from pagan influence, and consists of twelve red barbed wire spheres placed in a circle, which harkens to a protective ritual traditionally used to ward off evil spirits. Each sphere took approximately four hours to make, and was a two-person task. One person was to hold the barbed wire while the other strung the joints together. This had to be done in order to maintain the spherical structure of each piece. The spheres were then primed and spray-painted colonial-red. The twelve-piece installation is also representative of time, with each sphere marking the twelve hours on the face of a clock. This work is currently on display at the Oeno Gallery in Picton, Ontario. 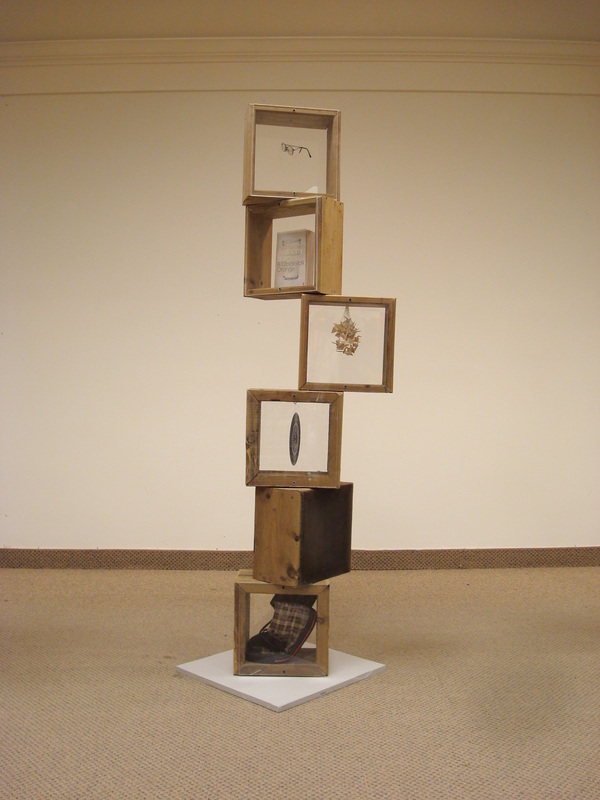 Significant Compartments is a 6’ autobiographical totem, and is inspired by the artist Louise Bourgeois. Each compartment represents a single aspect of Fraser, himself. From top to bottom, the compartments contain a pair of glasses, a copy of “A Clockwork Orange” by Anthony Burgess (Fraser’s favorite novel), a bundle of paper cranes in the shape of a human heart (representing his love for art), a 7” record (a tribute to his love of music), and a pair of shoes to carry him forward in life. Between the record and the shoes lies a mystery compartment that represents the uncertainty of the future. The bulk of Fraser’s work can be found on a canvas, and stands as a testament to his love of colour experimentation. Perhaps the most dynamic of his on-canvas works is “Light Bulb Crash (for Shozo)”. 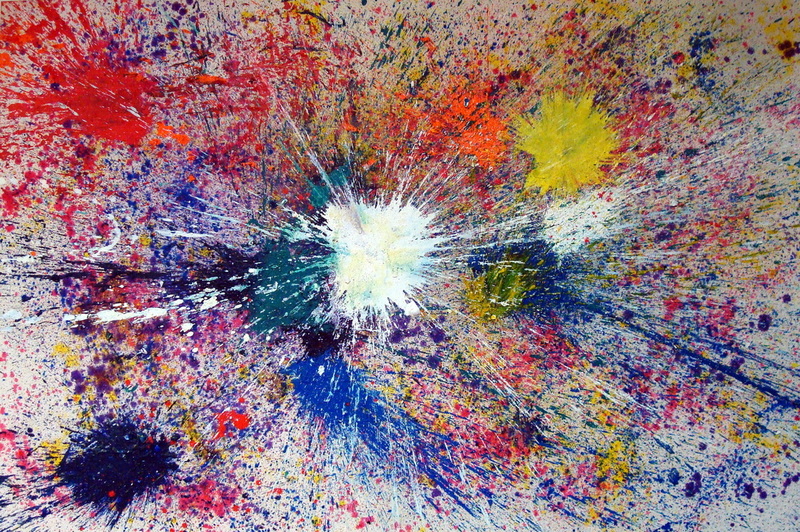 This memorial to avant garde painter Shozo Shimamoto is one of the more striking examples of his experimentation. This experiment took place in a garage, and required the canvas to be positioned on an old bunk bed frame. He filled gutted incandescent light bulbs with turpentine, oil paint, raw linseed oil, and sand. Once the contents of these light bulbs were mixed, he sent them crashing onto a canvas both by hand and by releasing them from a suspended position overhead. The result was a lively burst of colours and a smell of turpentine that had been successfully removed just in time for the painting’s premier at Fraser’s grad show (a feat that required fans blowing on the piece throughout the week). The mystery compartment of Fraser’s autobiographical totem is strikingly pertinent to the future of his work. With his experimentation in mixed media and sculptures that give us a body of work ranging from a thousand paper cranes flying from a book, to paint collections that vibrate, drag, spill and burst, there are worlds of possibilities open to him. For now, much of his career involves gathering materials and putting his inspiration to life, as well as the many tasks that are required of artists outside of the studio. Like many young artists today, Fraser must navigate the evolving social media biosphere, as well as attend exhibitions and collaborating with other artists. This in mind, Grog Boat is proud to highlight emerging talent in the arts, and I am happy to have kicked off our series with the works of Fraser Radford. You can visit Fraser’s website at http://www.fraserradford.com/. You can also visit his Facebook and Twitter.